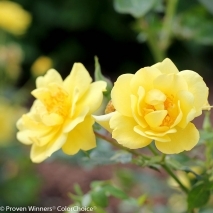 6/29/2015 - The American Rose Society (ARS) announced at the 2015 National Conference that Proven Winners® received the Award of Excellence for Oso Easy® Lemon Zest rose. To receive the Award of Excellence, a rose must prove its mettle in six different no-spray trial locations across the United States. This is the second Proven Winners rose to win this prestigious award; Oso Happy® Petit Pink rose received the Award of Excellence in 2012. Oso Easy Lemon Zest rose was developed by Chris Warner, the highly acclaimed rose breeder from Shropshire, England. After years of trials and evaluation by Proven Winners, Oso Easy Lemon Zest rose lived up to the highest standards. Unlike most yellow varieties, Oso Easy Lemon Zest rose exhibits a very high level of disease resistance and its sunny, canary yellow flowers do not fade to white. Like all Oso Easy® roses, it is hardy and free-flowering, self-cleaning with attractive, glossy green foliage.